For many of us, Columbus Day isn’t a day we notice all that much. Unless you are a federal employee or work in a state office where the holiday is also state recognized, many go about their normal schedules and lives and don’t pay it much attention except as a passing thought when the bank or local post office is closed. While the day has been recognized as an official holiday since 1937, Columbus Day has been celebrated for hundreds of years. So why the controversy when it has been observed for so long? For some, the idea behind the Columbus Day is to honor the spirit, drive, determination, and ambition, Columbus had in his vision of discovery – the same spirit many European settlers held on to as they immigrated to this land and made our country what it is today. But for many others, this is a strong reminder of a dark period in our country’s history that shouldn’t be celebrated at all as it eventually led to the deaths of so many indigenous people who inhabited the land thousands of years before the Europeans came. For this reason, a growing number of communities have started to observe Indigenous People’s Day to honor the people and their culture so gravely affected by Columbus’s “discovery.” There has been a call to make it a national holiday as well, to celebrate the resilience of the native people and as a reminder of this history. Regardless of which side of the controversy you sit on or whether you observe Columbus Day or Indigenous People’s Day, it’s important to recognize how the contributions of the Native American people have also made our country what it is today and celebrate them, their culture, and the gifts they gave. Native Americans were the first to raise certain animals for food, such as turkeys, guinea pigs, llamas, and honeybees. Many of the plant-based foods we eat today were first domesticated by Native Americans. These include vegetables such as corn, potatoes, sweet potatoes, squashes, pumpkins, and many types of beans; fruits like tomatoes, papayas, avocados, pineapples, and guavas; as well as chili peppers, peanuts, and chocolate. Native Americans also developed cotton and rubber. The Native Americans learned about and used many plants for medicinal and nutritional purposes. The Canadian Indians knew that by eating plants rich in vitamin C they could prevent scurvy and they taught the Europeans about this. 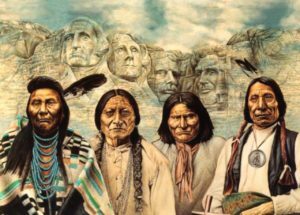 In Eastern North America, the Native American governments, in particular the League of the Iroquois, were used as models of democracy by the American colonists. The US government is set up on such a system with oversight being spread between the federal government and the states.